30 St Mary Axe, also known as “the Gherkin,” is a skyscraper located within London’s financial district. It was completed in 2003 and opened in May 2004. The building itself is 591 feet tall and has 41 floors. The building’s architecture is extremely impressive and over the years the Gherkin has become popular with tourists. In fact, many people consider the building to be one of London’s most iconic symbols. The Gherkin was built on the former location of the Baltic Exchange. The Baltic Exchange was the headquarters of a worldwide marketplace for shipping information. In 1992, a bomb exploded near the exchange. This bomb caused extensive damage to the building as well as its neighbors. The city of London wanted new developers to restore the building’s facade on to the Gherkin. Unfortunately, they soon discovered the damage was more extensive than they thought. For this reason, they did not insist on full restoration. The land was then sold to the Trafalgar House. The remaining structure was carefully dismantled. However, the facade and the interior of the Exchange Hall were preserved. The salvage eventually sold for 800,000 pounds. In 1996, Trafalgar House wanted to build a high structure called the Millennium Tower. The plans talked about a large building with office space, restaurants, apartments and gardens. After many objections by both officials and the public, the plans for this building were dropped. The original plan stated the building was to be 1,266 feet high. A revised plan with a lower tower height was accepted. St Mary Axe is a beautiful building. Visitors to London may want to visit the building and take some photos. It is worth noting that the building has been internationally recognized for its architecture. That being said, the building is not a tourist attraction in itself. The building contains offices, apartments, a restaurant and a bar. The bar is impressive as it offers 360 degree views of London. Unfortunately, it is not open to the public. The bar is for tenants and their guests. Those who want to get into the building should consider dining at the restaurant. Disabled visitors will be pleased to learn that there is a lift available for visitors with mobility issues. Some tourists may be wondering why they should visit a building which is not open to the public. The answer to this question is its stunning architecture. Most visitors will probably not see another building like St Mary Axe in their lifetime. The Gherkin has also been featured in a number of books, television series and movies. Some tourists consider it to be a must-see destination in London. Visiting the building is not difficult as it is located in a busy area that is close to public transportation lines. Those who are comfortable using the subway can get to there for a low price. As St Mary Axe does not offer shows or exhibitions, visiting the building should not take too much time. Most visitors allocate one or two hours to visiting the Gherkin including transport time. Those who plan on dining in the restaurant may need to set aside more time. St Mary Axe can easily fit into a tourists’ London itinerary. Tourists can visit the Axe on their way to other attractions. Some of the most popular tourist attractions in London are Buckingham Palace, the Tower, Westminster Abbey, the Natural History Museum and the London Eye. Independent travelers can organize their own itinerary. People who do not have the time or energy to do this may want to consider taking a day tour. There are numerous day tours which show tourists several attractions in one day. Some of these tours may pass by significant buildings such as the Gherkin. Consumers should ensure that their tour includes this building before they book. 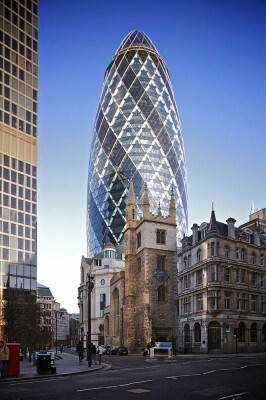 St Mary Axe is a must see attraction for anyone who is interested in history or architecture. Even those who are not interested in these things will enjoy seeing a building that is commonly depicted in popular culture.